Nova Scotia (Latin for New Scotland; Gaelic:Alba Nuadh; French: Nouvelle-Écosse; Mi'kmaq: Gespogwitg; German: Neu Schottland) is a Canadian province located on Canada's North Atlantic coast. It is the most populous province in Maritimes, and its capital, the Halifax Regional Muncipality, is the economic and cultural center of the region. Nova Scotia is the second smallest province in Canada, with an area of only 55,284 km², but its population of 937,889 Nova Scotians (or, less formally, Bluenosers) makes it the seventh most populous province. Nova Scotia's economy continues to be largely resource based, but has in recent years become more diverse and therefore more resilient. Traditional industries such as fishing, mining, forestry and agriculture remain very important, and have been joined by tourism, technology, film production, music and other cultural industries. The territiory now known as Nova Scotia was home to the Mi'kmaq when the first European settlers arrived. In 1608, French settlers estabished the first permenant settlement north of Florida at Port Royal, founding what would become known as Acadia. The British Empire obtained control of the region between 1713 and 1760, and established the new capital at Halifax in 1749. Nova Scotia was one of the founding four provinces to join Confederation with Canada in 1867. In 1620, the Plymouth Council for New England, under James I of England/James VI of Scotland designated the whole shorelines of Acadia and the Mid-Atlantic colonies south to the Chesapeake Bay as New England. In the latter 1620s, a group of Scots was sent by Charles I of England and Scotland to set up the colony of 'Nova Scotia'. (The Latin appellation was so stated in Sir William Alexander's 1621 land grant.) However owing to the signing of a peace treaty with France, the territory was given to the French and the Scots ordered to abandon their mission before their colony had been properly established. The French took control of the Mi'kmaq and other First Nations territory. In 1654, King Louis XIV of France appointed aristocrat Nicholas Denys as Governor of Acadia and granted him the confiscated lands and the right to all its minerals. British colonists captured Acadia in the course of King William's War but Britain returned it to France at the peace settlement. It was recaptured in the course of Queen Anne's War and its conquest confirmed in the Treaty of Utrecht of 1713. France retained possession of Île St Jean (Prince Edward Island) and Île Royale (Cape Breton Island) on which it established a fortress at Louisbourg to guard the sea approaches to Quebec. This fortress was captured by American colonial forces, then returned by the British to France, then ceded again after the French and Indian War. Thus mainland Nova Scotia became a British colony in 1713, although Samuel Vetch had a precarious hold on the territory as governor from the fall of Acadian Port-Royal (Annapolis Royal) in October 1710. British governing officials became increasingly concerned over the unwillingness of the French-speaking, Catholic Acadians, who were the majority of colonists, to pledge allegiance to the British Crown, then George II. The colony remained mostly Acadian despite the settlement of a large number of mostly German foreign Protestants along the South Shore in 1750. In 1755, the British forcibly expelled the Acadians in what became known as the Great Expulsion. The colony's jurisdiction changed during this time. Nova Scotia was granted a supreme court in 1754 with the appointment of Jonathan Belcher and a legislative assembly in 1758. In 1763 Cape Breton Island became part of Nova Scotia. In 1769, St. John's Island (now Prince Edward Island) became a separate colony. The county of Sunbury was created in 1765, and included all of the territory of current day New Brunswick and eastern Maine as far as the Penobscot River. In 1784 the western, mainland portion of the colony was separated and became the province of New Brunswick, and the territory in Maine entered the control of the state of Massachusetts. Cape Breton became a separate colony from 1784 to 1820, when it was again joined to Nova Scotia. Ancestors of more than half of present-day Nova Scotians arrived in the period following the Acadian Expulsion. Approximately 30,000 United Empire Loyalists (American Tories) settled in Nova Scotia (when it comprised present-day Maritime Canada) following the defeat of the British in the American Revolutionary War. Approximately 3,000 of this group were slaves of African ancestry, about a third of which soon relocated themselves to Sierra Leone in 1792. Large numbers of Gaelic-speaking Highland Scots emigrated to Cape Breton and the western portion of the mainland during the late 18th century and 19th century. About one thousand Ulster Scots settled in mainly central Nova Scotia during this time, as did just over a thousand farming migrants from Yorkshire and Northumberland between 1772 and 1775. Nova Scotia was the first colony in British North America and in the British Empire to achieve responsible government in January-February 1848 and become self-governing through the efforts of Joseph Howe. Pro-Confederate premier Charles Tupper led Nova Scotia into the Canadian Confederation in 1867, along with New Brunswick, Quebec, and the Province of Canada. Nova Scotia was the first Province in Canada to vie for independence from Canada. In the Provincial election of 1868, the Anti-Confederation Party won 18 out of 19 Federal seats, and 35 out of 38 seats in the provincial legislature. For seven years, William Annand and Joseph Howe led the ultimately unsuccessful fight to convince British Imperial authorities to release Nova Scotia from Confederation. A motion passed by the Nova Scotia House of Assembly in 1868 refusing to recognize the legitimacy of Confederation has never been rescinded. Nova Scotia flags flew at half mast on Canada Day as late as the 1920s, at the end of the Maritime Rights Movement. 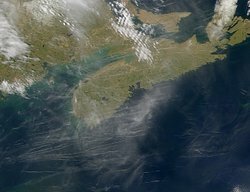 The province's mainland is a peninsula, connected to mainland North America by the Isthmus of Chignecto, and surrounded by the Atlantic Ocean, including numerous bays and estuaries. 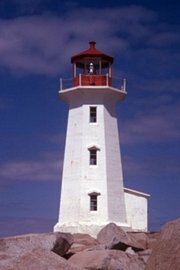 Cape Breton Island, a large island to the northeast of the Nova Scotian mainland, is also part of the province, as is Sable Island, a small island notorious for its shipwrecks, approximately 175 km (95 nm)from the province's southern coast. 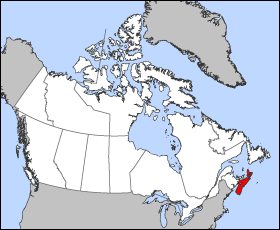 Nova Scotia is Canada's second smallest province in area (after Prince Edward Island), and no point in Nova Scotia is more than 56 km from the sea. 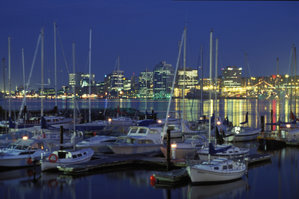 Nova Scotia is the seventh most populated province in Canada with an estimated 937,889 residents as of July 1, 2005. It accounts for 9% of the population of Canada. The population density is approximately 17 persons/km². Roughly 60% of the population live in rural parts of the province. In about 1861, the population was about 331 000 people and the population of Halifax alone was 29 580. Per capita income is just over $30,000 (Can), of which just over $19,000 is disposable. According to the most recent federal government census conducted in 2001, 95.4% of Nova Scotians are Canadian born. Of the 4.6% of Nova Scotia residents who had immigrated to Canada, 45% per cent of immigrants were from Asia; 29.3% were from Europe (excluding the United Kingdom); 21.9%, the Middle East; 11.8%, the United States; and 6.8%, the United Kingdom. In the same census, 50.7% of Nova Scotians indicated that their single ethnic origin to be "Canadian", which are mostly made of up of British, Irish and French ancestries. 30.8% indicated it to be "British and Irish"; 7.2%, "European"; 5.5%, "French"; 2.1%, "Black"; 1.9%, "Aboriginal Canadian"; 0.6%, "Arab/West Asian"; 0.4%, "Chinese"; 0.4% "South Asian". Each other category - "Filipino", "Japanese", "Korean", "Latin American", "Southeast Asian", and "Visible minority, n.i.e." - accounts for less than 0.2% of the population makeup. The Bluenose, which appears on the back of the Canadian ten-cent piece (dime) and current Nova Scotia license plate was built in Lunenburg, a town on the South Shore. 500–1000 Nova Scotians today are fluent in Scottish Gaelic.